This has truly been a Year of a Million Dreams for me, and, in all honesty, I haven’t won a thing. A year ago the Main Street Gazette did not exist, and a year ago I did not know some of the amazing people I know, or know of, now. Taking a glance back, I find it fun to find how I reached this point. Please forgive an old, young, man’s reminiscing, if you aren’t interested in seeing how I found my way here, then simply slip on down past this article, or return tomorrow, and we’ll continue inside our hollowed happy grounds. A year ago, I had no idea how deep the Disney community went. I hung out on a message board or two, but it seemed like real solid, treasured, information was hard to come by. I knew that I had more Disney love to share with everyone than most people would, frankly, ever want to know in their lifetime. Then, it happened, I received an iPod for Christmas and was off like a shot. On the same day I discovered MouseTunes (which consequently turned into WDW Radio Show and Magical Definition), Netcot, and WDW Today podcasts. There were people who had insane amounts of Disney knowledge just floating around in their brains! They did not work for Disney either, and they had found a way to share their knowledge with others! I gobbled up every podcast I could find. I finally felt like I was home, and among true friends to boot. This went on for a few months, and I shared bits of information I could with these fellow enthusiasts, and sent along my own questions. My fiancée was happy that I found others like myself, or dismayed, I am not quite sure which, but she knew I still wanted to share my knowledge with others, and hoped I would find my own way soon. It was then that I stumbled upon Jeff Pepper’s 2719 Hyperion. Here was the key to the way I could share what I knew with others. After a little research, and a lot of hesitation, I launched the Main Street Gazette in late August. 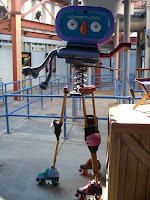 Besides sharing the knowledge, and ideas, I had for Walt Disney World, I wanted to also create articles that were child friendly as well as provided adults with interesting tidbits. I still struggle to find the balance between the child in us all and adult guide book information, but as long as the responses continue to be positive I will continue to fight the good fight. We were small those first few months, but readers continued to come, and several stuck around, and the community grew a little larger. Along the way I met terribly interesting people, other bloggers, like George and Andrew, Ray, Christine, and Doc. All with tons of information and awareness they were willing to share. I had a wonderful opportunity, in the latter part of this year, to be at Epcot as it celebrated its 25th anniversary. I was able to meet several people that I had talked with in the Netcot forums, I was even able to spend a moment with Jim MacPhee, the big cheese at Epcot. But what made me truly happy about this trip, was that I was able to spend this momentous occasion with my dad, the man I must give credit to, or curse for, my introduction to Walt Disney World and for continuing to further my addiction as a child. This was the first time either of us had returned to Walt Disney World since my aunt, his older sister, had been killed in a car accident on her way to work, she worked in Security for Disney, and I think it did us both a world of good to have the other there. I find it truly amazing how the human spirit can endure great hardships, and smile through the tears. Near the end of October, I was part of an event that no Disney Magic could ever hold a flame to, though there was plenty of magic there. 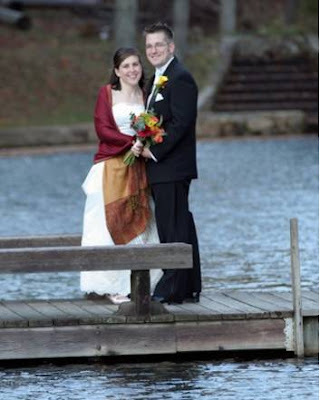 On the evening of 27 October 2007, I married my true love, Aileen. She accepted me whole-heartedly, my Disney compulsions and all. Really, that’s all I have to say about that. For part of our honeymoon I was able to walk in Walt’s footsteps and explore Disneyland, I don’t know if there were ever a happier person in the Happiest Place on Earth. I was married and I was completing a pilgrimage I had not thought possible on a preschool teacher’s income. Those were truly happy days! I returned home to find that my request for assistance in creating a logo for the Main Street Gazette had been heard, and, in the process, found another true Disney spirit in Eric. The work he did for the Gazette was truly remarkable, as you can see above, and I want to take this opportunity to thank him once again. As the year progressed, and my new wife and I settled into our new life together. She took my birthday as the opportunity to surprise me with a visit to Disney’s Hilton Head Island Resort. This was the third time I had stepped onto Disney property this year, actually in the past three months. Usually I am lucky if I make it to Walt Disney World once a year, I felt like a true Disney World-Traveler. Reaching the end of the year, my wife and I have been moving into a bigger place. And, wouldn’t you know it, the Disney gods found a way to tie this back into the Magic as well. Though I am not going to divulge my entire address, this would be a true folly on my part, I will tell you that the number of the townhouse we are now living in is number 33. That’s right, the same number as the famous dining establishment of Disneyland, Club 33. Like Club 33, our office, the headquarters of the Main Street Gazette, is on the second floor. The minute we moved in my wife knew she was in trouble. However, the office/guest bedroom is not nearly as exclusive as Club 33 and, so far as I know, no presidents have ever dined here. But it is warm and welcoming to the weary travelers I’m sure will be passing through, and I’m sure they won’t mind the Disney décor too much (I have been given the office and half bath to decorate, so that my Disney paraphernalia cannot be found wandering about throughout the rest of the house). Speaking of Disneyland, I found this small plaque/sign/emblem along the entrance to Mickey’s Toontown while we were on our honeymoon. The Benevolent & Protective Order of Mouse. Has a nice ring to it, doesn’t it? I have run this name around my head a number of times, but I truly believe that this society is the same group of people I have had the pleasure of including in my daily life. Though I know most of them only through email, comments, or perhaps only through their voices, these are all people that have inspired me to do more, and have awed me with their knowledge. 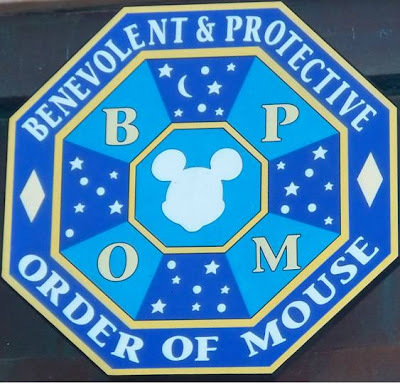 If anyone belongs to the Benevolent & Protective Order of Mouse it is people like Lou Mongello, Nathan M. Rose, Van, Mike Scopa, Mike Newell, Matt Hochberg, Len Testa, Deb Wills, Jeff, Jessica, George, Andrew, Eric, Ray, Christine, Joel, Doc, and Tim Devine. They are true keepers of the Magic. I know that there are others of you out there, and I will find you, I promise. But to those of you above, I may not know each of you personally, but I hope I get the chance one day, because you are so much a part of what I have been, and will continue doing, here, and you are all amazing people. So, thank you, one and all, for bringing me a step closer to my dreams. I received a copy of the Magic Kingdom Game last year from a co-worker as a birthday/Christmas gift, and couldn’t have been more surprised if Walt Disney himself had walked through the door. Apparently, my love of all things Disney is as transparent as if I were wearing my heart on my sleeve. Needless to say, I ripped the game open the minute I returned home and force my wife (then fiancée) to play a round, or five, with me. The point of the game is to make your way through the Magic Kingdom, stopping at the attractions you have cards for, using pathways or the train stations, before making it back to the exit before any of the other “guests.” Sounds like the game should have been called Magic Kingdom Commando, huh? Along the way Event Cards (like Fastpasses and Parades) and collecting Mickey and Donald’s autographs can help you, hurt your opponents, or hinder your quest. Overall, the game is good clean family fun, but I didn’t start this article to write a review of the game, I wanted to write about the oddities I found within the game. 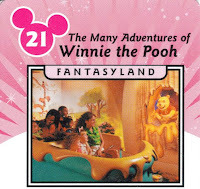 Because, the Magic Kingdom Game, is one coast-confused board game. I know that Disneyland has been referred to as the Magic Kingdom, but it is clear from the onset that this game is set in the Magic Kingdom of Walt Disney World. The lands included are: Adventureland, Frontierland, Liberty Square, Fantasyland, Toontown, and Tomorrowland; Main Street U.S.A. is used solely as a pathway to, and from, the Entrance. So, let’s visit these fantastic lands one at a time, and see what befuddlement the ladies and gentlemen at Parker Brothers created for our token guests. The confusion begins almost immediately. Alongside such attractions as the Jungle Cruise and the Magic Carpets of Aladdin, rests a famous Treehouse. This Treehouse, however, is not of the Swiss Family persuasion. 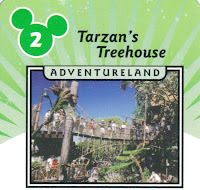 This Treehouse belongs to the vine swinging Tarzan, who’s Treehouse can be found inside of the borders of Disneyland. 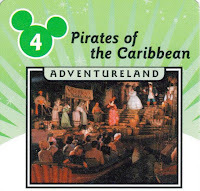 As if that were not confusing enough, Pirates of the Caribbean, a staple of Walt Disney World’s Adventureland, but Disneyland’s New Orleans Square, is also thrown into the mix. Talk about a True Life Adventureland! Next stop, Frontierland. Thank goodness for some semblance of customary theme park arrangement. Here you can find both Splash Mountain and the Country Bear Jamboree, among others. 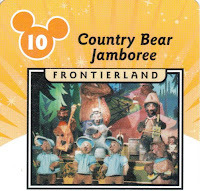 While both of these may be found, or have been found, in Disneyland’s Critter Country, both are in their rightful East Coast placement here, Frontierland. Okay, it appears that order has been restored. 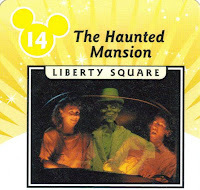 Liberty Square is on the map, and it even brought the Haunted Mansion with it. This nineteenth century mansion bares no pillars of the plantation found in Disneyland’s New Orleans Square. Thank goodness, maybe this has all been a nightmare. I knew I stayed one too many nights over at the Hollywood Tower Hotel. Yes, we’re in tip top form now. Peter Pan’s Flight, it’s a small world, Snow White’s Scary Adventure, Winnie-the-Pooh (another Critter Country favorite in Disneyland), Sleeping Beauty Castle, Cinderella’s Golden Carrousel,… Wait, wait, wait! 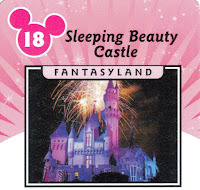 Back this train up, Sleeping Beauty Castle?!?! What in the wide, wide, Wide World of Sports Complex is this icon doing here? Clearly we have not returned from the Twilight Zone yet. This, to me, is the most striking contradiction, setting up a board like Walt Disney World’s Magic Kingdom, complete with Liberty Square, and without Critter Country or New Orleans Square, but switching the iconic castles and placing Sleeping Beauty Castle squarely in the middle of the park. Stepping back a bit, it is clear that we have returned to Florida, as the kiddie-coaster in Toontown displays the name Barnstormer, not Gadget. 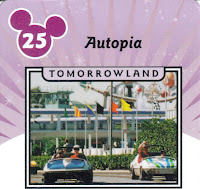 Let’s hurry through Tomorrowland, and then blow this popsicle stand, or cart rather. The quagmire just gets stickier and stickier. Here we find the Walt Disney World staples of Space Mountain, Astro Orbiter, Tomorrowland Transit Authority (cough, WEDway Peoplemover, cough), and Carrousel of Progress. 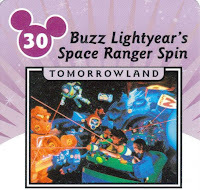 Even Buzz Lightyear can be found here, in his Space Ranger Spin incarnation, not Astro Blaster mode. But, to top of our predicament, the Magic Kingdom Game decides to take us on the raceway of Autopia, not along the curves of the Indy Speedway, and on the highway in the sky, the “Disneyland” Monorail System. 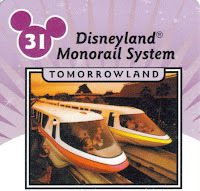 To add fuel to the fire, the Disneyland Monorail System card uses an image of two monorails passing by Walt Disney World’s Polynesian Resort. I think it is time to remove ourselves through the Entrance, and catch our breath. Alright, looking back over the devastation of East Coast and West Coast ideals, I can understand what I believe the creators of this game were intending. 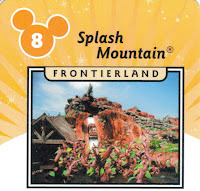 They were trying to find a way to incorporate aspects of both parks into a single game so that they needed only one game, rather than two games, each an exact replica of their namesake park. This is a very sound idea, in theory, however, once executed, this game looks like the red-headed step child of the Disney Parks, at least within the United States, you are given the less prominent castle (for those of you who have not seen both, they are both beautiful, but Cinderella Castle stands head and shoulders above its older sibling) and the much less active land of Liberty Square, rather than the bustling New Orleans Square. I don’t know that there actually is a proper way to combine these two very distinct parks into one board, but this, most certainly, is not the way to go. As far as game play goes, I think this is a very unique approach to a board game. But, next time, let’s just pick one park and stick with it. Thanks for all the warm wishes on my ear infection/ear drum rupture, I am feeling much better, if still half deaf. On top of all the holiday merriment I have been spreading with my family, my wife and I are also moving. (Double the space, YEAH!) I thought I would be able to post some articles I was planning on finishing in the past week, but unfortunately, due to my illness, I didn't finish them and our packing and moving have taken my computer, and research/writing time, away from me. So, expect the Main Street Gazette to be back up and running at full speed by the New Year! Thanks for all of your continued support, have a fantastic New Year, and we'll see you on the other side! Hello friends, sorry the articles have been sporadic for the past few days. I had a ear infection that burst my ear drum in my left ear. It appears that all is going to be fine and there will be no lasting damage, but I'm still a little under the weather. However, I didn't want a little something like that to keep me from wishing you, as well as your loved ones, a most happy holiday! Thank you for sticking with the Main Street Gazette, we are still young, but we have plenty more magic to discover together. So thank you to the friends of the Gazette who have supported us with their readership, their camaraderie, and their talents, may the New Year bring you all a little magic in your lives, you deserve it! So, from my family to yours, thank you, and have yourself a very merry holiday! MuppetVision 3-D, on either coast, is a must see every time I step onto Disney property. 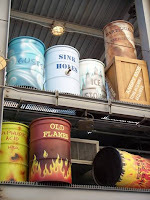 Even though I grew up on the East Coast, with the Muppets from Disney Studios’ Streets of America, I was looking forward to finding new Muppet details in California Adventure’s Hollywood Pictures Backlot version. California Adventure’s movie, along with the theater interior, are identical. Waldorf and Statler are still spouting off, the Swedish Chef is armed and ready in the projection room, and, by the end of the film, there are still signs of destruction everywhere. I know you’re shocked, I was too. However, while there are some similarities outside of the theater doors, including a very similar overall layout, these attractions’ queues and surrounding areas couldn’t be more different if they were night and day. Let’s start with the queue film and move back outside as we go. Hey, we’re talking about the Muppets here, why would I want to do something normal, like starting at the beginning? The queue film itself is also the same version that entertains us in Florida. On the other hand, the two queue rooms are strikingly different. 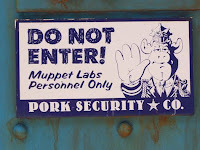 While California has a few gags spread about the room, there is not the plethora of witticisms running amuck that I had become accustom to in the Disney Studios’ MuppetVision holding pen. While there were a few interesting suitcases belonging to various Muppets, there was not A Net Full Of Jello, or other thinking man’s gags. As we continue our shuffle backwards, no running please, it’s hazardous to your health, and no moonwalking either, because, well, it’s moonwalking. Now we come to a hallway, the heart of Muppet Labs, and their various testing facilities. Among others, the Stress Testing and Artificial Reality labs are hard at work on both coasts. The only true difference here are the aesthetic styles of the doors, and even that in negligible. 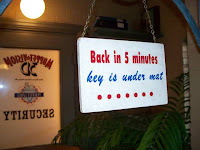 Continuing in reverse, we come to the beginning of the hallway, and the Muppet Security Office. Both are, apparently, on permanent lunch breaks. 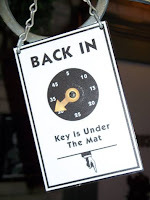 The keys are both under the mats and, again, the only real differences here are minor and aesthetic. Oh, except for the fact that the MuppetVision in California Adventure is missing the fabulous directory that is choke full of Muppet Goodness, and soup, in Disney Studios’ MuppetVision. Withdrawing ourselves to the outside queues is where the attractions take a serious departure from one another. Removing the surrounding visual elements for a moment, don’t worry, we’ll come back to them, just like we are coming back to everything today, let us just take the queues for what they are. 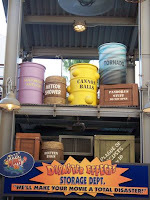 In California Adventure it appears as if you are wandering through the storage area of MuppetVision. 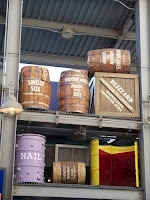 From a gaggle of gag barrels to the MuppetVision camera, there is enough to keep your eyes occupied here, and looking away from the actual building, so that you don’t notice how little was done to mask the gargantuan square building that forms the theater. 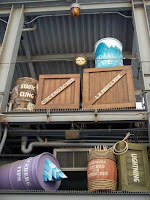 In comparison, the Disney Studios outside queue is no longer in use, but, should you be able to sneak a peak around the corner, there are also jokes abound for you to discover, from ice cream sundaes to Muppet light fixtures. While entirely different in their avenue of thought, the two outside queues give guests enough laughs to tide them over until they reach the interiors or, in our case, the exteriors. The most startling deviations between both MuppetVisions can be found here, amongst the exteriors and their surroundings. Surrounding the Disney Studios rendering are fountains, a shop, billboard advertisements, and other gags, such as the Gone to Lunch painters. On top of these, the building itself is themed perfectly to its surroundings, the brick façade and New York type park square find a harmony together that you come to expect from Disney. Yet, in the exteriors of the Hollywood Pictures Backlot MuppetVision, these classic thought processes seem to have been shoved aside. The facades that separate the main thoroughfare from MuppetVision have no actual tie to the Muppets, save the corner entrance which is, in fact, a theater boasting MuppetVision. Once around the corner the building itself is a plain boxy building with nothing to stimulate your sense of vision. While I love MuppetVision no matter where I am to get my fix, it seems clear to me, after a lot of back tracking, that the version on the Streets of America is better suited to its surroundings. Hollywood Pictures Backlot’s Muppet Vision has some fabulous elements that are on par with many of the fabulous facets found in Disney Studios, but, in the end, falls flat like one of Fozzie Bear’s jokes. You can call me bias if you like, but I prefer my Muppets with a Florida Swagger, which, incidentally, can also be done backwards. 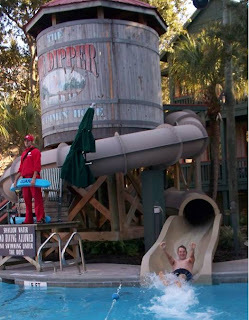 A good portion of the childhood memories I have of Walt Disney World took place within the grounds of Fort Wilderness. Some of the most vivid instances involved the Campfire Sing-A-Longs and outdoor movies. Whether roasting marshmallows, walking along the trails back to our site in the dark, visiting with Chip and Dale, or perhaps catching the glimpse of a shooting star, thinking back on those days harkens back to a simpler time in all of our lives, when we were young and carefree. 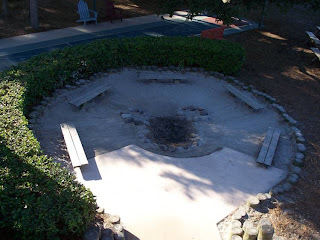 While at Disney’s Hilton Head Island resort earlier this month I found the fire pit that they use for Campfire Sing-A-Longs, near the Broad Creek Mercantile. The Campfire is apparently very popular, even in early December, at the Resort. It put me in high spirits to see that a tradition of my childhood had been reproduced in a new environment for other young folk to enjoy. If only the campfire pit at Fort Wilderness had those ears! If you are taking a look around the site today, you might have noticed some changes. Well, Christmas came a little early here at the Main Street Gazette. Our good friend, and contributor, Eric Hoffman redesigned our logo and our background template, giving the site more of a newspaper feel. I cannot express how truly appreciative I am of his help! Eric is also thinking about jumping in to the Disney blogging game, so I hope to see more of him around here, as well as out and about on his own! You can guarantee that if he starts his own site, the Main Street Gazette will be there to report on it. We also are in the process of moving to a new address. The Main Street Gazette is moving to www.mainstgazette.com. We tried to get www.mainstreetgazette.com, but unfortunately a realtor had already scooped it up. The address will be changing over the next few days, so keep your eyes out. Oh, and when we have finished unpacking, if you are currently a friend of the Gazette, and link to us from your site, we would really appreciate it if you could switch the address as well. We know it takes some time, but we will really appreciate it! We are sure we are going to like our new home just fine, and we hope you will to, because while the outward appearances may be changing, the content you come to know and love isn’t going anywhere! This is a copy of the birthday card I received from Shadow for my birthday a few weeks ago. As I began to put it away today, with the rest of my paper Disney memorabilia, I made a startling discovery! 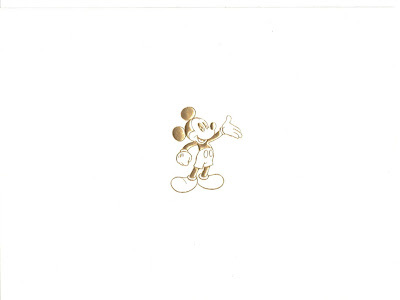 Does anyone else find it slightly alarming that our favorite mouse has no sign of his tail? It was certainly disquieting to me. The only rational thought I had about the incident was that Shadow, in an attempt at playfulness, took one too many nips at Mickey Mouse’s tail, and Mickey decided to tuck it away for safekeeping. I expected an injury to the child or a friend. I was prepared for an argument over a scooter or dump truck. I was even tempted to think that perhaps there was a bird, rabbit, or some other critter on the playground. What I turned around to see however, was a four year old boy waving a worn paintbrush at me. 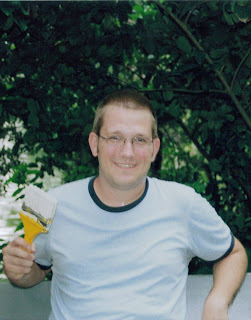 Besides the fact that I don’t know where this paintbrush, clearly intended for a preschool art center, had made it onto the playground, the next words from the child’s mouth sent he into a full on spin. While jumping up and down he was shrieking, “I found the paintbrush, I found the paintbrush, I found the…,” well, you get the idea. For those of you on the outside of this fantastic free, for all intents and purposes, Fastpass, let me elucidate. As the tale spun by Mark Twain goes, Tom and Huck gave up white washing the fence and hid their paintbrushes in order to run off and partake in some tom foolery. Well, true to the tale that inspired its creation, there are paintbrushes hidden around Tom Sawyer Island. Should you be lucky enough to stumble upon one of these paintbrushes while exploring the island, or if you should actually find one as is your sole purpose for visiting the island, then you should return it immediately to the pilot of the raft. 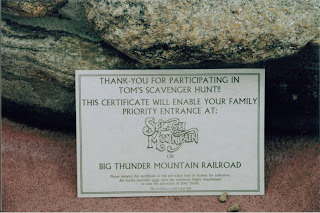 Once back on the mainland side of the Rivers of America, the raft pilot will present you with a certificate that will enable you, and your party, for priority entrance at either Splash Mountain or Big Thunder Mountain Railroad. Priority entrance, incidentally, is easily translated as Fastpass entrance, only without the time window. These paintbrushes are not easy to come by as this little activity has move from undiscovered to a must-see on everyone’s itinerary. However, if you are on one of the first rafts over in the morning, or visit later in the day, after the paintbrushes have been returned to the island, you odds of finding one of the concealed brushes increase. Meanwhile, back in my bewildered state on the playground, I couldn’t understand how this child knew about this great little secret of the Magic Kingdom. Finally I cut my way through the fog of my consciousness and realized he had just found something that had excited him, and we went off to discover what we could use the brush for today. But, in my Disney drowning and addled brain this child thought that we were indeed going to have some fantastic adventure in Frontierland. Truth be told, if I had my way, I’d take all of them with me on an exciting journey there, and I suppose that is part of what I do every day. I enable their adventures, and they keep me young, exceedingly young, marvelously young, young by hundreds of years, younger than I will ever be again. 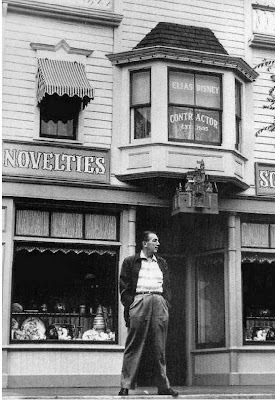 Just ten short days ago we celebrated the birth of our great friend, Walt Disney. Today we honor his memory again, and celebrate the life and the many worlds he gave to each of us. Thank you for opening so many doors, windows, and books, thank you for opening so many eyes, so that each of us could find our own adventure to live. Thank you, Walt Disney. It is time to prepare for your first flight, and today your will be training on a glider. After making your way down the Concourse, you are given your preflight instructions, be sure pay close attention to your flight plan. As you board your glider, be sure that the runway lights are lit, and that you have been cleared by the tower for take off, then smoothly pilot your craft into the wild blue yonder. Gently drift over the various landscapes of California, from San Francisco and Los Angeles, to the Anza-Borrego dessert, Redwood Creek, and Yosemite Falls, and along Monterey Bay, Lake Tahoe, and Malibu, before your carefree flight draws to a close at Disneyland, complete with a firework finale. Be sure to keep a keen eye out for other aircraft and gliders, as well as errant sporting equipment and local inhabitants. After a safe landing, be sure to check that you have all of your carry-on items. Nice work, Captain, you have certainly earned your wings today. This morning, while we are surrounded by the many holidays that assemble during the winter, I thought we should take a look at the cards I am sending out in 2007. What I love most about these cards that are available is that they are ambiguous as to a specific holiday. 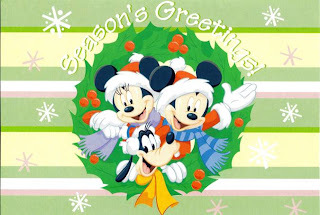 True, there are wreaths and Santa hats, but no where on, or inside of, either card does it say Merry Christmas. While this may seem a trite item to be excited about, it means the world to me as a preschool teacher. 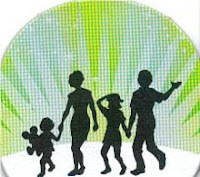 As is best practice when dealing with toddlers and preschoolers, the exclusion of any holiday while talking about the winter holidays basically allows a learning opportunity to slip away. So, while I myself will be celebrating Christmas this year, as I have every year of my life, I find it heartwarming that at least Disney has taken a first step towards including all of us with its holiday offerings. 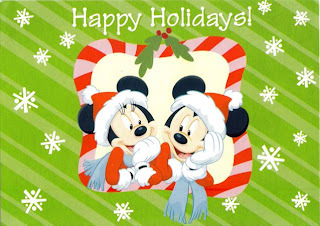 I also found the Minnie and Mickey card to be truly fitting for the first holiday season my wife and I are spending together as husband and wife. Especially considering we had the Mickey and Minnie cake topper for our wedding. Shadow isn’t the only character to be found around Disney’s Hilton Head Island Resort. Aside from Hidden, and decorative, Mickeys there are several places to get your fix of more conventional characters. 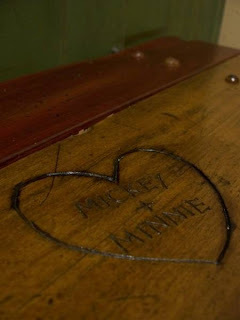 For starters the Mouse himself, along with his one and only gal Minnie, have carved their names into the foyers’ benches. As an added touch, a heart was carved around the names to ensure they would never be separated. 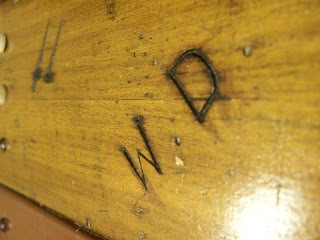 Along the same bench are the initials, W.D., for the man behind the Magic, Walt Disney. While I love that he was given his own detail here, I truly feel an opportunity was missed by not having the initials read W.E.D. After all, Imagineering wasn’t originally called WED Enterprises for nothing. 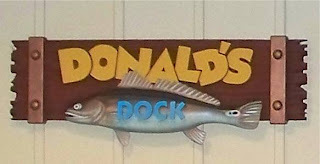 Lastly, along the back wall of the Community Hall sits a sign dedicated to our favorite quack-up, Donald. 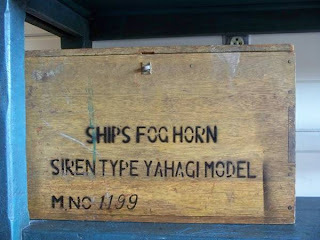 Speaking of quack-ups, the word play here is simply fabulous. 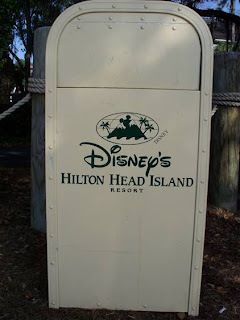 Disney’s Hilton Head Island Resort, which is located on the Longview Island region of Hilton Head, actually has a permanent guest. Her name is Shadow, a golden retriever. 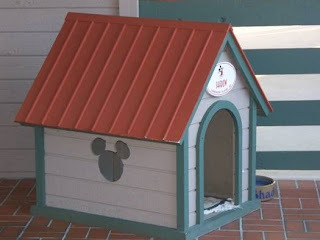 As the story goes, a pup on the construction site of Disney’s Hilton Head Island Resort always found a way to be mischievous. 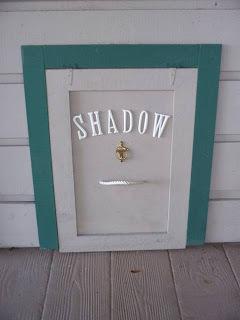 Though trouble seemed to be her middle name, she frolicked her way into the heats of the Imagineers, construction crew, and cast members, so that they felt they had no choice but to give her a magical home and a name, Shadow. After searching, unsuccessfully, for Shadow the entire weekend, my wife was convinced that perhaps Shadow had moved on to a better place. She was unable to dissuade me however, and I continued to follow the evidence, Shadow’s shadows if you pardon the phrase. 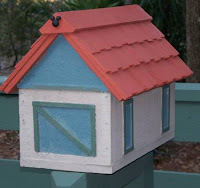 After spotting her dog house on the porch, and her doggie door near the Broad Creek Rentals, I went in search of more substantial clues. The first sign Shadow left behind was a paw print in the foyer of our room. 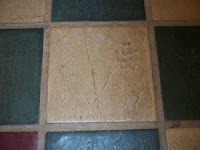 Clearly her ill-timed antics had caused damaged to the tiles, but we felt it simply made the room feel more lived in. 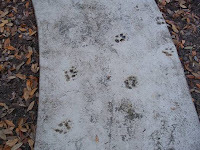 Shadow’s paw prints were a key find, not only were they in the room, but also along a path near the Big Dipper Pool. Clearly she had innocently been on her way for a dip in the pool to cool herself off when she happened upon the drying cement. Shadow knew that I was on her tail, and she is very proud of the fact that she can mystify guests. So, to mock me, or because she was flattered and wanted to flatter me in return, when I returned to our room the next day, Shadow had left me a set of four balloons and a birthday card. Shadow signed the card herself. As we were preparing to leave the following afternoon, a Sunday afternoon, we found Shadow had been rounded up for her weekly bath. I had a heart to heart, or rather nose to muzzle, with Shadow before we had to get on the road. 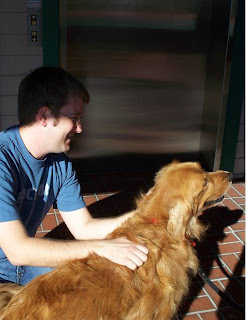 Shadow had, like the cast members, Imagineers, and construction crew members before me, found her way into my heart. Going back to work after a long weekend can be tough, and today has been no exception, I am actually working right now, well, not right now, but I will be when you read this. 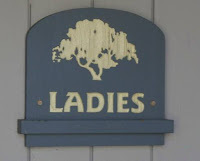 In honor of this day going down the commode, I offer up my favorite restroom signs from Disney’s Hilton Head Island Resort. 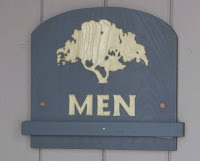 The elegance of this carved tree, on the restrooms next to the Community Hall, seems to recall a simpler time to me. It also reminds me of the trees I grew up with in Central Florida. Over at Disney’s Beach House, these guides to the restrooms are given their own signals. 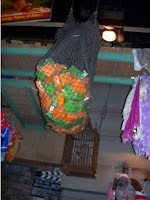 And since it is the season of giving, rather than receiving, here is a trash can and a crate for my fellow connoisseurs.